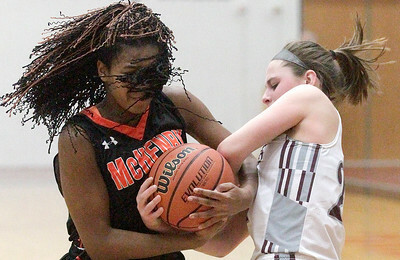 Matthew Apgar - mapgar@shawmedia.com McHenry's Julia Rice, left, reaches around for the ball as Alyssa Clark of Prairie Ridge eyes the hoop during their IHSA Class 4A regional semifinal girls basketball game on Tuesday, Feb. 16, 2016 at McHenry High School West in McHenry. 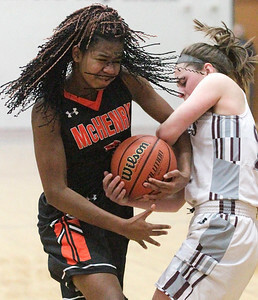 Matthew Apgar - mapgar@shawmedia.com Haylee Giffels of Prairie Ridge, left, battles for control of the ball with Isabel Gscheidle of McHenry, right, during their IHSA Class 4A regional semifinal girls basketball game on Tuesday, Feb. 16, 2016 at McHenry High School West in McHenry. 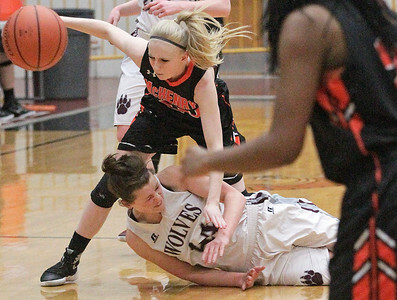 Matthew Apgar - mapgar@shawmedia.com McHenry's Julia Rice, top, chases the ball as Kirsten Voel-Pel of Prairie Ridge tumbles to the hardwood court during their IHSA Class 4A regional semifinal girls basketball game on Tuesday, Feb. 16, 2016 at McHenry High School West in McHenry. 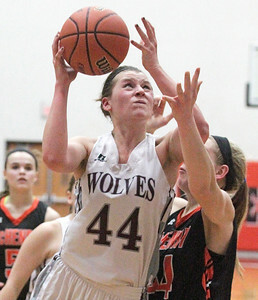 Matthew Apgar - mapgar@shawmedia.com Isabel Gscheidle of McHeny, right, jumps up to attempt to block a shot by Sammi Lockwood of Prairie Ridge, left, during their IHSA Class 4A regional semifinal girls basketball game on Tuesday, Feb. 16, 2016 at McHenry High School West in McHenry. 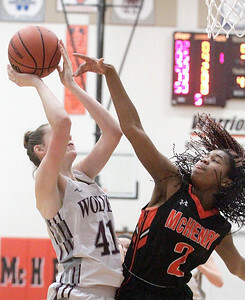 Matthew Apgar - mapgar@shawmedia.com Kaleigh Johnson of McHenry, right, fouls Kirsten Voel-Pel of Prairie Ridge on a shot attempt during their IHSA Class 4A regional semifinal girls basketball game on Tuesday, Feb. 16, 2016 at McHenry High School West in McHenry. 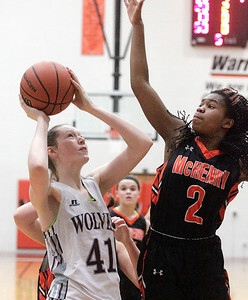 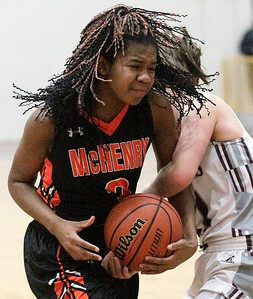 Matthew Apgar - mapgar@shawmedia.com Nicole Dorn of Prairie Ridge, left, defends against McHenry's Autry Hartfield, right, during their IHSA Class 4A regional semifinal girls basketball game on Tuesday, Feb. 16, 2016 at McHenry High School West in McHenry. 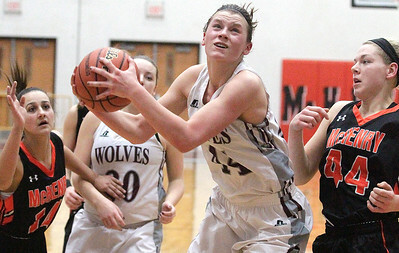 Matthew Apgar - mapgar@shawmedia.com Isabel Gscheidle of McHenry, left, battles for the ball with Emily Perhats of Prairie Ridge during their IHSA Class 4A regional semifinal girls basketball game on Tuesday, Feb. 16, 2016 at McHenry High School West in McHenry. 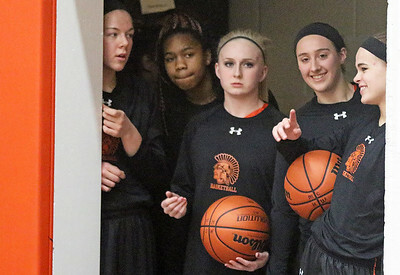 Matthew Apgar - mapgar@shawmedia.com McHenry girls wait to take the court against Prairie Ridge before their IHSA Class 4A regional semifinal girls basketball game on Tuesday, Feb. 16, 2016 at McHenry High School West in McHenry. 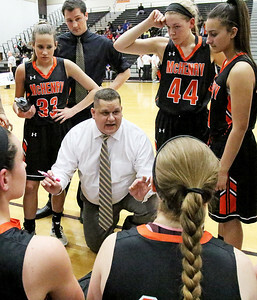 Matthew Apgar - mapgar@shawmedia.com McHenry coach Rob Niemic talks with the Warriors between quarters during their IHSA Class 4A regional semifinal girls basketball game against Prairie Ridge on Tuesday, Feb. 16, 2016 at McHenry High School West in McHenry. 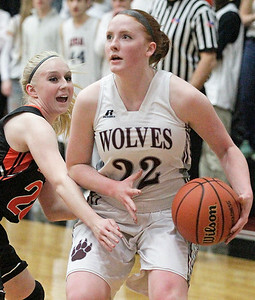 Matthew Apgar - mapgar@shawmedia.com Kirsten Voel-Pel of Prairie Ridge snags the rebound and shoots it back up in front of McHenry's Autry Hartfield, left, and Elizabeth Alsot, right, during their IHSA Class 4A regional semifinal girls basketball game on Tuesday, Feb. 16, 2016 at McHenry High School West in McHenry. 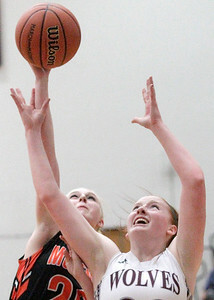 Matthew Apgar - mapgar@shawmedia.com Julia Rice of McHenry, left, and Alyssa Clark of Prairie Ridge reach out for the rebound during their IHSA Class 4A regional semifinal girls basketball game on Tuesday, Feb. 16, 2016 at McHenry High School West in McHenry. 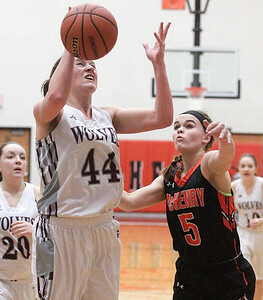 Matthew Apgar - mapgar@shawmedia.com Kirsten Voel-Pel of Prairie Ridge, left, shoots the ball over McHenry's Elizabeth Alsot, right, during their IHSA Class 4A regional semifinal girls basketball game on Tuesday, Feb. 16, 2016 at McHenry High School West in McHenry. 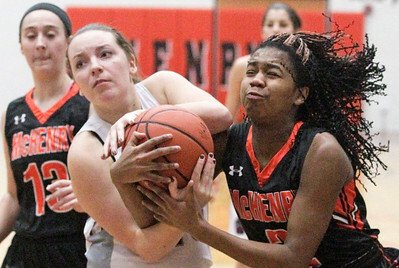 Julia Rice of McHenry, left, and Alyssa Clark of Prairie Ridge reach out for the rebound during their IHSA Class 4A regional semifinal girls basketball game on Tuesday, Feb. 16, 2016 at McHenry High School West in McHenry.